We set off on 20th February from Carrick Little Car Park at around 2.00pm for the summit of Slieve Binnian. The weather was calm, cold but sunny. 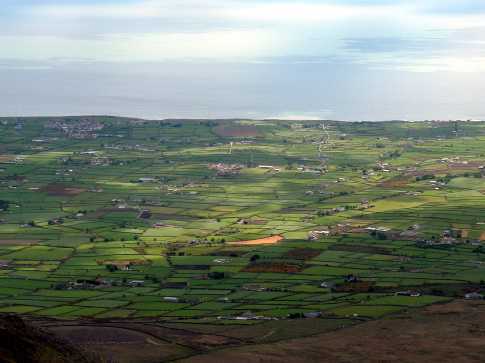 The Mournes were fog free, but a bank of fog out on the Irish Sea was edging towards the Isle of Man and another was encroaching slowly from the direction of Newry. We made our way along a muddy farm road and across a stile to continue up the Annalong Valley walking parallel to a fence and then close to the Annalong Woods. The track was quite rugged underfoot and boggy in places but infinitely preferable to the ‘pathway’ the National Trust has laid on the route up to Slieve Donard from Newcastle. 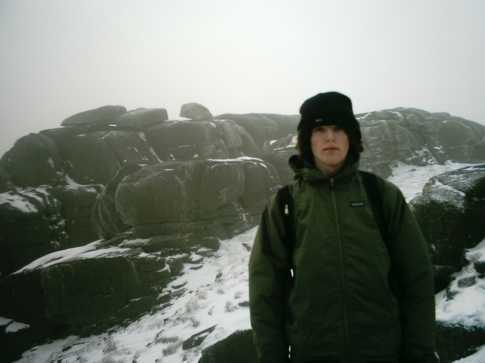 As we advanced it became quite icy underfoot and day old snow adhered to the rocks and vegetation on and near the path. Close to Blue Lough which was frozen, we took the left-hand path towards the saddle between Slievelamagan and North Tor. There is a large boulder here that is fun to clamber onto and offers fine views over the Ben Crom Reservoir. We scrambled up a steep rocky pathway covered with snow towards North Tor, deviating slightly at the top to take in the fabulous view down over the Ben Crom Reservoir. Freshly made rabbits’ paw prints were imprinted in the snow that crisply covered the hillside and glistened magically in the late afternoon sunshine. By now a blanket of impenetrable fog was making its way stealth-like from the direction of the Silent Valley and was slowly encroaching on the Ben Crom Reservoir. We climbed higher and passed beneath the towering hulk of North Tor towards the Back Castles that were encrusted in snow and small icicles and looked as if they had been foam blasted. Squeezing through a narrow gap between two huge boulders we gained our first view of a frigid Binnian Lough and Slieve Binnian above with its jagged tors drifting in and out of view like an apparition through wisps of fog being blown up from the valley below. 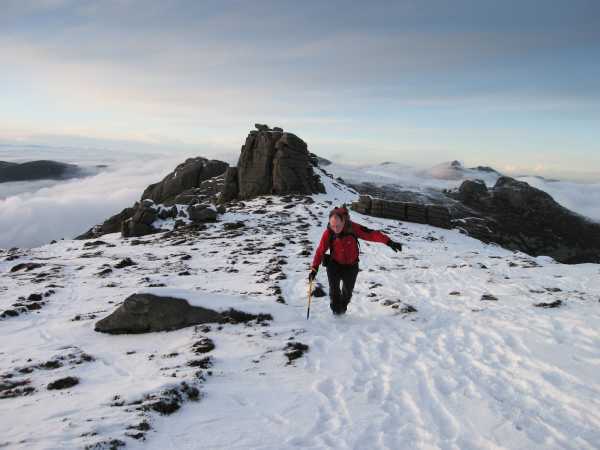 We followed the ridge towards the summit through quite thick snow that had drifted in places, scrambling up onto the tor as the sun was beginning to set. From the summit we were exhilarated to find that we were looking down on dense cloud as if from an airplane. Illuminated eerily by the setting sun, the fog had surrounded Slieve Binnian and only the tops of the highest mountains including Slieve Donard and Slieve Bearnagh were visible. Carrick Little carpark at J 345219 A was the starting point for my Binnian walk. I followed the track up into the valley via a thoughtful stone stile. I left the main track and kept close to the wall on my left as I started to climb. I ignored other walls that branched off. The views across the valley and over the Annalong Wood were great with Donard and Commedagh clearly visible to the north. I eventually climbed over the wall at approx J 327234 C and headed towards Binnian East Top. A strong wind pushed me up to the summit. Great views to the south towards Slieve Foye and beyond. I battled the wind back to the wall and followed it up to a stile at approx J 325233 D. I crossed the stile and headed off to a point between two summit tors. I decided not to just follow the wall as it seemed to head directly to a rocky tor which looked dangerous to climb. I quickly reached the summit of Slieve Binnian. I enjoyed the amazing views and explored the tors. I expected to find the summit busy but there was no one there. Besides the lack of people I was also amazed at the lack of wildlife-are there no deer or hares in the Mournes? 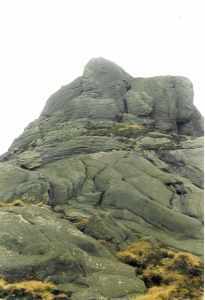 I next headed to Binnian North Top and North Tor, admiring the celebrated Back Castles on the way. I climbed the North Tor from the East side. It was a spectacular viewpoint and an excellent location for lunch. 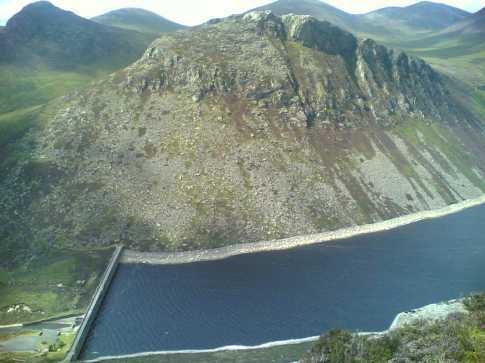 The first people I saw in the Mournes that day jogged past below- these Mountain Runners are a tough breed! Again I thought it a shame that so few appeared to be out enjoying these beautiful hills. Next I dropped down to the track at J 321256 B, admiring the view of Ben Crom Reservoir from Buzzard’s Roost (J319253 E) on the way. My original plan to head home down the track was abandoned as I headed up Lamagan. Walking alone brings this freedom of deciding on a whim to alter a planned walk. I found it tough going and I was glad to stop and chat to a couple on the way up. They eagerly named all visible summits, reminding me of my habit of offering to help every time I see a car stopped at Sally Gap in Wicklow with bewildered tourists poring over a map! After Lamagan I headed NNE into the col at J 331267 F and up Cove. The top arrived quickly and I briefly enjoyed the view before heading back to the col and headed SE to find the marked track on the map. This brought me down the side of the bluffs in the area of J 334261 G where I saw rock climbers hard at work. I saw people camping in the trees as I passed Annalong Wood which I thought was pleasant until I saw the remains of previous camps. Abandoned torn-down tents, rubbish, old fires and damaged trees. I then met a loud group of lads heading up from the carpark toting crates of beer. Top of Binnian, close to the end of a long but very beautiful walk. Started in the car park at the Silent Valley reservoir, followed the road to the Ben Crom dam and then the track to the Hare's Gap. From the Gap, walked to the Castles under Commedagh and then returned to the car park via Beg, Cove, Lamagan, Black Castles, Binnian, wee Binnian and Moolieve. The descent from Binnian was difficult, as apart from the steep incline, the snow covered the holes and cuttings in the rocks and tracks, leading to more than one tumble on the way down.